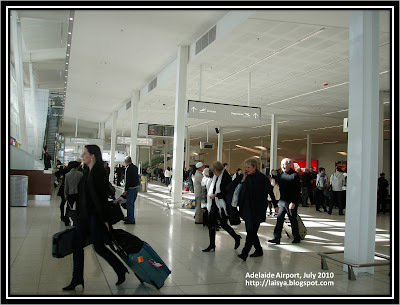 This month I went to Airport (Adelaide Airport in particular) for several times. Pick up some friends or just got there to flight to other Aussie's states. I like to see many dramas in Airport. I can see people hug each other (or even kiss :P), smile and laugh when they meet or even cry when they have to say goodbye. Yeah, Airport is the place to be either happy or sad! So, if I get on board before someone else in my row, I always pull out my book from my bag and start reading and hoping that the one who will sit next to me is a charming prince hahahaha .... :lol: In contrast, the "imaginary" charming prince will feel so bad that he has to sit next to me. That's it! I love airport, such a perfect stranger for others! hahaha...kayanya sama dengan adikku ga?